Are you considering moving to Colorado? If you are looking for information about the area, and help with your move to Colorado then please allow us to guide you. We will provide you with up to 10 free and personalized quotes from top experienced long distance moving companies who will safely transport your possessions from door to door, inter-state or internationally. The State of Colorado, also widely known as ‘The Centennial State’, is located in the Rocky Mountain region of the United States of America. Colorado is a part of the Western and Southwestern regions of the United States. Its capital is Denver, which also is Colorado’s most populous city. Bordering the US state of Colorado lay Wyoming to the north, Utah and Arizona to the west, Oklahoma and New Mexico to the south, Nebraska and Kansas to the east. Citizens of Colorado are known as Coloradans, or Coloradoans. Colorado is best known for its famous Rocky Mountains, and for the year-round destination that boasts spectacular national parks, forests, gold-rush ghost towns and Native American ruins. The capital of Colorado, Denver, is the gateway to numerous ski resorts and is home to many museums, parks, gardens and a restored Victorian square. Located at 1,609m (5,280ft) above sea level, on high rolling plains at the foot of the Rocky Mountains, Denver, known as the Mile High City, has a population of 500,000 people and is the largest city within a 1,000 km (625-mile) radius. Founded as a gold-mining camp in 1859, Denver was the centre of the Old West, filled with wagon trains, cowboys, Native Americans, gamblers and gunfighters. The geography of the State of Colorado is diverse; it includes both rugged mountainous terrain, and vast plains. Colorado is one of only three US states (with Wyoming and Utah) that have only lines of latitude and longitude for boundaries. The largest area of the world famous Rocky Mountains is situated within Colorado. The Rocky Mountains, often called the Rockies, are a broad mountain range in western North America. The Rocky Mountains stretch more than 4,800 kilometers (3,000 miles) from northernmost British Columbia, in Canada, to New Mexico, in the United States. The peak of Mount Elbert, at 4401 meters (14,440 feet) above the sea level, situated in Colorado’s Lake County is the state’s highest point and the highest point in the entire Rocky Mountains within the continental United States as well. The Rocky Mountains within Colorado contain 54 peaks that are 14,000 feet (4270 m) or higher, known as fourteeners. The Colorado Mineral Belt, stretching from the San Juan Mountains in the southwest to Boulder and Central City on the front range, contains most of the historic gold and silver mining districts of Colorado. Colorado is the only U.S. state that lies entirely above 1000 meters (3281 feet) elevation. GMT -7 (GMT -6 from first Sunday in April to last Sunday in October). The capital, Denver, has a mild, dry climate with an average of 300 sunny days a year. Spring is mild with warm days and cool evenings; summer has very warm days with low humidity and cool evening breezes. Denver often enjoys an Indian Summer right into November, while winter is cold, sunny and crisp, with some snowfall. The mountains enjoy warm summer days with cool evenings. Autumn arrives early in the high ground, with abundant snowfall from December to April and temperatures around freezing point. Rainfall is meager, averaging about 15 inches (380 mm) annually. Warm clothing, especially in the mountains, from November to March/April. Cottons and linens during the summer months. The population of the state of Colorado was 4,861,515 in 2007, showing a 13,03% increase compared to year 2000. The bulk of Colorado’s population lives along the eastern edge of the Rocky Mountains in the Front Range Urban Corridor. The median income in Colorado is $51,022, what gives the state 10th place regarding the income received, between all the American states. Denver area is home to 2, 927,911 people, and that is more than two-thirds of the state population. Immigration from outside the United States increases, just like the migration within the country. Approximately 9.7% of the population that live in Colorado, are foreign born. That includes an estimated 150,000 illegal immigrants (3.1% of the state population). The largest ancestry groups in Colorado are German (22%), Irish (12.2%), and English (12%). Persons reporting German ancestry are the largest group in the state and are especially strong in the Front Range and eastern Plains. People of British extraction are the largest group in the western Rocky Mountains. The center of population of Colorado is located just north of the town of Critchell in Jefferson County. The biggest cities of Colorado are Denver – the capital of the state, and Aspen. Denver is situated 1.6km (1 mile) above sea level on the Colorado Plains. Denver, also known as ‘the Mile High City’, lies at the geographical centre of America, midway between Mexico and Canada. It is a major transport hub where highways and railways converge, and its international airport has become a focus of worldwide trade. Over 60% of the population are in-comers, and people come here attracted by the lack of crowds, friendly people, a good lifestyle and a mild climate. With over 300 days of bright sunshine each year, Denver outshines San Diego and Miami Beach. About 1953, after the construction of the first skyscrapers, Denver started its transformation from a cow town to a vibrant modern city. Founded during the ‘Pikes Peak or Bust’ gold rush of 1858, Denver still maintains a mining and oil exploration industry, although this is now a much smaller part of its economy. The city’s new prosperity is a result of timely diversification into high-tech industries. Its success is evident everywhere – in new buildings, business opportunities and population growth. (website: www.flydenver.com) is one of the largest airports in the world. It covers 137 sq km (53 sq miles), which is twice the size of Manhattan Island. The airport is located 38km (24 miles) northeast of Denver, and it takes 30 minutes to get from Denver to this airport. One can get to/from DEN by SkyRide buses that run to downtown Denver and Boulder. Taxis, shuttle buses, public buses and limousines are available to the city as well. 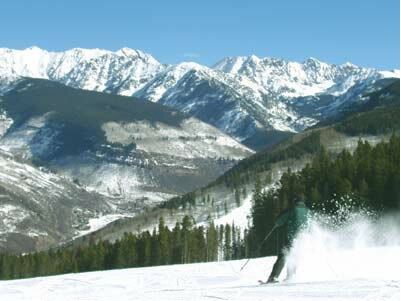 There are also many shuttles that operate services to Colorado’s various resorts. Airport Facilities: The airport has ATMs, bureaux de change and a post office. Computer data jacks are found at all pay telephones located around the airport. Internet connection facilities are offered in some bars and restaurants, and at kiosks on the concourses. An information desk is located in the terminal Arrivals level at DEN. Airport information is available (tel: (303) 342 2000). From London to Denver is 10 hours, and from New York to Denver is 3 hours 40 minutes. There are many parking options at the airport (tel: (303) 342 7275) including two short-term parking garages, located just east and west of the terminal. There are more than 7,000 spaces in each garage. Uncovered economy parking is also available. Pikes Peak Shuttle Lot is located south of Pena Boulevard on 75th Avenue for long-term parking. Shuttles drop passengers off at check-in. The Mt Elbert Shuttle Lot is for overflow parking in a remote car park, also served by a shuttle. Valet parking is accessible via the Arrivals roadway on Level 4 on the east and west sides of the Terminal. Expansion of the parking facilities is due for completion during 2008, while a rail link from Denver’s Union Station is planned to be built by 2015. Car hire companies include Advantage, Alamo, Avis, Budget, Dollar, Enterprise, Hertz, National, Payless and Thrifty. Service desks are located on level 5 of the terminal building. All companies provide a courtesy shuttle service to the pick-up car parks. The major ski resorts are all served by their own airports with domestic flights from many major centres in the USA. Domestic airports do not have departure tax. Denver’s growth is historically linked to its importance as a rail centre. It is a hub on the major Amtrak East–West route (tel: + 1 800 872 7245; website: www.amtrak.com), with daily services to Chicago and San Francisco on the ‘California Zephyr.’ Westbound trains pass through Glenwood Canyon, which is one of the most beautiful railway routes in the USA. The ‘Southwest Chief,’ which links Chicago with Los Angeles, passes through the southeast corner of the State, where a bus link to Denver is available. The Ski Train (tel: (303) 296 4754; website: www.skitrain.com) makes a scenic two-hour journey through the Rockies during the skiing season and on Saturdays in summer. Greyhound (tel: 1 800 229 9424; website: www.greyhound.com) has a terminal in downtown Denver, at 1055 19th Street. From Denver to Albuquerque is 9 hours, to Salt Lake City is 10 hours, to Dallas is 16 hours, to St Louis is 17 hours, to Minneapolis is 17 hours 30 minutes, to Chicago is 20 hours 20 minutes, to Los Angeles is 24 hours, to Seattle is 28 hours 30 minutes and to New York is 37 hours. From Denver to Cheyenne is 2 hours 30 minutes, to Albuquerque is 9 hours 30 minutes, to Amarillo is 10 hours 30 minutes, to Kansas City is 13 hours and to Las Vegas is 16 hours. Denver is well served with buses and a light rail system run by RTD (website: www.rtd-denver.com), as well as taxis. Car hire is readily available too. There are restaurants offering Southeast Asian cuisine, innovative New Southwestern cuisine and international cuisines in every price range. For a distinctly Colorado-style meal, visitors can visit Denver, Boulder and many mountain towns, which offer freshly brewed local beer and delicious food. Steamboat (website: www.steamboat.com) (with its nickname Ski Town USA and its distinctly Western heritage), and Ski Sunlight (website: www.sunlightmtn.com) (with the world’s largest hot springs pool. All the resorts offer reliable amounts of snow and an extensive range of accommodation and other facilities. View the skyline from the Colorado State Capitol (website: http://www.milehighcity.com/capitol/), with its spectacular genuine gold roof and sweeping views over the city and the Rockies. See the US Mint, the second-largest storehouse of gold bullion in the USA after Fort Knox in Alaska. Experience the Denver Botanic Gardens (website: www.botanicgardens.org). They are comprised of water gardens, a Japanese garden, a rock alpine garden and a conservatory housing a collection of orchids and bromeliads. View the red sandstone pinnacles of the Garden of the Gods (website: www.gardenofthegods.com). Experience Mesa Verde National Park (website: www.nps.gov/meve/index.htm), located in the high plateau country of southwestern Colorado. The 21,044-hectare (52,000-acre) park is designated as a World Heritage Site and contains some of the largest and most impressive examples of the dramatic Anasazi culture’s cliff dwellings. Built over 700 years ago, these amazing structures have as many as 200 rooms. The park has paved roads offering views over the major ruins. There is a museum that attempts to explain the riddle of why the Native Americans built their villages in caves, and why, by the year 1300, they had completely abandoned the Mesa Verde plateau. Explore the Rocky Mountain National Park (website: www.nps.gov/romo), located 104 km (65 miles) northwest of Denver, and Colorado’s most popular attraction. Reaching heights of 3,736m (12,183ft), Trail Ridge Road crosses the park and forms one of the highest continuous highways in North America. Massive peaks, rugged canyons, flower-strewn meadows, peaceful lakes and thundering waterfalls combine to offer the visitor over 640 km (400 miles) of spectacular wilderness. With its majestic mountain backdrop and picturesque main street, the resort village of Estes Park (website: www.estesparkresort.com), on the edge of Rocky Mountain National Park, is very popular with visitors. Explore the 16th Street Mall, which is very popular with shoppers, and is always alive with pedestrians, cafes, street performers and fountains. Enjoy an American football game. Travel on the Manitou & Pikes Peak Cog Railway (website: www.cograilway.com) which is offering views of the Continental Divide. Ski the Rocky Mountains (website: www.nps.gov/romo), renowned the world over for unparalleled skiing. In recent years, the region has gained considerable popularity with European ski enthusiasts as well as visitors from within the USA, and the range of facilities and accommodation is unrivalled. Enjoy the snow at Aspen (website: www.aspenchamber.org), located 256km (160 miles) west of Denver. The resort attracts the rich and famous from all over the world and is perhaps America’s most sophisticated ski resort, offering a full range of winter and summer activities and countless restaurants and shops. Visit Vail (website: www.vail.snow.com), two hours west of Denver. This resort town is among the top ski destinations in the nation and built in a Tyrolean style. Ski or snowboard in Summit County, home to the popular ski resorts of Keystone (website: www.keystone.snow.com) (with the longest ski season in the state), Arapahoe Basin (website: www.arapahoebasin.com), Copper Mountain (website: www.coppercolorado.com), and Breckenridge (website:http://www.breckenridge.com/). The City and County of Denver has a general sales tax of 3.62%, a 4.0% sales tax on food and liquor for immediate consumption, and a 7.25% sales tax on the rental of automobiles for less than 30 days. Denver is a Home Rule City, and The Colorado Department of Revenue does NOT collect sales tax for home rule cities. Denver is located in the Regional Transportation District, which has a sales and use tax of 1.0%, the Scientific and Cultural Facilities District with sales and use tax of .1%, and the Football Stadium District with a .1% sales and use tax. The city sales tax rate is 2.2%. Please note that this is a Home Rule City too. Already decided on a long distance move to Colorado? Then FILL IN OUR ONLINE ESTIMATION FORM stating your specific requirements, and we will provide you FOR FREE with up to 10 quotes from the best movers, all this with no obligation from you. Feel free to choose whichever moving company you believe best suits all your relocation needs, and then contact us for support. We will gladly help you with your move.